Steven N. Liss is Ryerson’s Vice-President, Research and Innovation, and a professor of Chemistry and Biology in the Faculty of Science. He is an experienced academic leader who has played a significant leadership role in the advancement of university education at the undergraduate and graduate levels at several universities. His recent return to Ryerson, April 2017, follows a decade of distinguished service at the University of Guelph and at Queen’s University, where he served as Vice-Principal (Research) and a professor of Environmental Studies and Chemical Engineering since 2010. For his contributions to Canada’s research and innovation ecosystem, Steven was awarded the Queen Elizabeth II Diamond Jubilee Medal in 2012. He has also held positions on a number of boards and councils: he was the Chair of the Ontario Council on University Research (OCUR) for 2015-16, and Chair of the Board of Management of TRIUMF, Canada’s national laboratory for particle and nuclear physics, for 2014-2016. 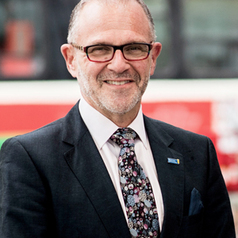 He has played an important leadership role nationally in the advancement of support for digital infrastructure as the founding co-chair of the Leadership Council on Digital Infrastructure (LCDI) and a founding board member and Corporate Officer of Compute Ontario. He currently sits on the board of Compute Canada, and previously served as the inaugural Chair of the Review Panel for the Ministry of Research and Innovation, Ontario Research Fund Research Excellence program (Environment and Emerging Technologies Panel). Steven is an internationally recognized researcher in the areas of environmental biotechnology and engineering, as well as wastewater and water management. He is also well known for his work in applied microbiology, which focuses on bioflocculation, microbial structures, and the fate of contaminants in engineered and natural environmental systems. Steven has an impressive funding track record, including industry and international support. He is an elected member of the Management Committee of the International Water Association Specialist Group, Microbial Ecology in Water Engineering (MEWE), and he has served as an elected researcher representative on the board of the Canadian Water Network. His recent honours include a Visiting Professorship at the Advanced Environmental Biotechnology Centre affiliated with the Nanyang Environment and Water Research Institute at the Nanyang Technological University in Singapore (2016); a Visiting Professorship with the College of Environmental Sciences and Engineering at Tongji University in Shanghai (2015-2018); and the position of High-end Foreign Expert of the State Administration of Foreign Experts Affairs for China.